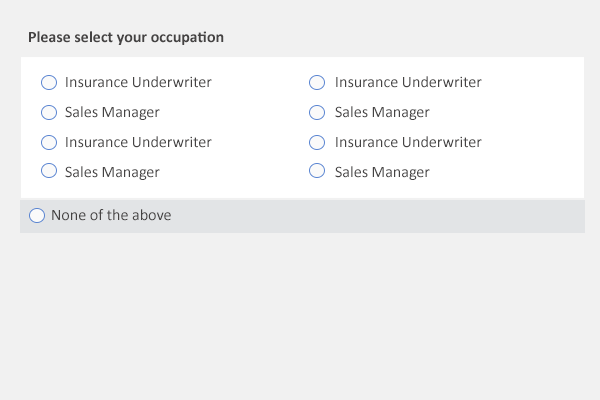 I am making an insurance related form where only "none" is selected option in the list of occupation. What is the best way represent it so that user go through all options before selecting "None". I am currently using a drop-down with 'None of the above' as last option. An example to clear what I am asking - let's say there are 5000 models of cars and only 50 of them are not allowed. I want user(its given that every user owns a car) to select none if user don't own any of those 50 cars. It depends on the context and how much options the user have, let's assume that the user will select the brand of the car he has and there are many options, but the user does not own a car, so if the user has to click on the dropdown will be an unnecessary action since he does not own a car . Assuming that every user has a car, then he needs to select a brand in the dropdown and that dropdown has a filter to make the search easier. "None of the above" is understandable, but I would go for a solution like "Other". I believe that it is more common practice for a dropdown and it has a positive message, rather than the negative message of "None of the above". Present a plaintext list of the 50 disallowed models, followed by a checkbox saying "I hereby declare that my car is not one of these". The user shall check or not check that box. I would suggest that the best way is to positively identify the make and model of car in question and then have a automated process to determine whether it is eligible or not. simply making the user choose from a list of every possible car is going to result in a very clunky form. In the UK at least it is possible to identify the make and model from the registration number and, in my experience this is what most insurance forms do. If this is impractical a selection tree of Make>>Model>>Type(engine size/body style etc) is still a lot easier than trying to find the one you are interested in from a long list. With a list you are forcing users to scan every single item to ensure it does not apply to them, if this is more than half a dozen items they are likely to either give up or make an error. To put it another way it is much easier to find a specific item on a list than to check every single item on a list to make sure it doesn't apply to you. Alternatively, if you're concerned they'll miss their model among the noise, or that they'll guess the reason you're asking and try to pretend they accidentally answered wrong, make it a freeform text entry box and interpret their response later. One field asks the user whether they have a whatever (e.g. a car) and has two radio buttons - "Yes" and "No". The second field, usually hidden but shown if the user clicks Yes on the first field, offers a Combobox of items (e.g. cars) to choose from. Well, obviously, you just ask them about each of the disallowed models in turn. "Is your car an Alpha Romeo Giulia?" "Is your car a Beta Beetle?" "Is your car a Zebra Impala?" That way, you know they read all the available options. Not the answer you're looking for? Browse other questions tagged user-behavior selection or ask your own question. How can I prevent the user from deselecting all the checkboxes?